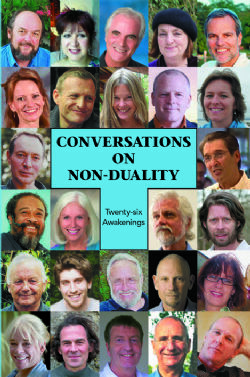 Conversations on Non-Duality: Twenty-six Awakenings is a fascinating compilation of life stories of perfectly ordinary people, from a rich variety of backgrounds, all of whom have been through extraordinary experiences leading to amazing new perceptions. Some have been seekers from a very young age, whilst others had previously never even thought in terms of ‘seeking’. Seeking for what? Nevertheless, all shared a common sense of dissatisfaction with their lives and a longing for happiness, connection, health, love, fulfilling relationships, wealth and freedom. This collection of life stories explores the means by which each individual went about achieving an end to their ‘suffering’. Some started with therapy, self-help workshops or read books written by spiritual masters, whilst others travelled to exotic places and studied with gurus. Others leapt from the despair of addiction to drugs and alcohol to simply waking up unexpectedly to a new reality. The warm openness with which these people tell the stories of their journeys ranges from the funny to the moving, tragic and inspiring, but there is something common to each which speaks to a part of ourselves that is profound, complete and never changing – a part shared by all living things. In simple terms, Non-Duality means no separation. Although it appears that there are separate individuals and objects in our world, in reality there is only Oneness. The spiritual search is the search for Oneness, for completeness and for unity. When this realisation truly hits us, it can transform us and our lives. Conversations on Non-Duality: Twenty-six Awakenings comprises edited transcripts of interviews with Jeff Foster, Gangaji, Wayne Liquorman, Francis Lucille, Mooji, Tony Parsons, Genpo Roshi, Rupert Spira, James Swartz and Pamela Wilson, among others, all conducted exclusively for Conscious TV, an internet TV channel broadcasting programmes on Health, Consciousness, Science, Non-Duality and Life Stories. These twenty-six inspiring journeys offer the insights and wisdom of ordinary men and women from many cultures and from a wide range of social, economic and ethnic backgrounds.